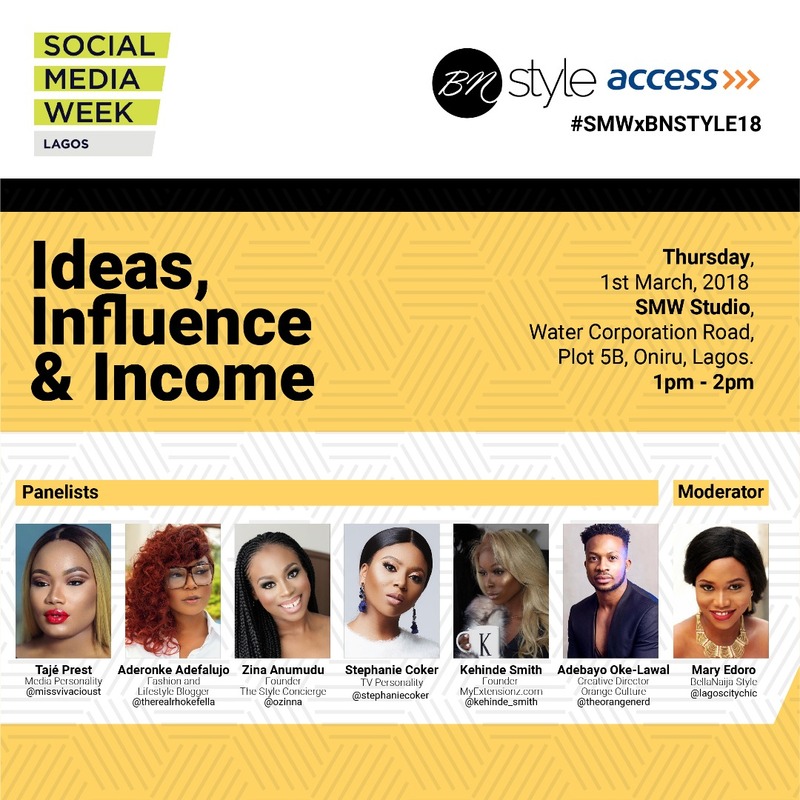 #SMWxBNSTYLE18: Join us at Social Media Week 2018 for the Ideas, Influence and Income Panel on the 1st of March! Africaâs largest tech and digital media eventÂ Social Media Week LagosÂ begins on the 26th of February 2018 andÂ Â in partnership with Access Bank will be hosting a panel on theÂ 1st of MarchÂ titledÂ The Business of Style â"Â Ideas, Influence and IncomeÂ â" a panel discussion with 6 of the most influential social media, branding and marketing leaders in the countryÂ #SMWxBNSTYLE18. Itâs so amazing how many opportunities are available on social media, and by extension, the internet. How do you tap into these opportunities just like the influencers you know did and are doing? How one can move from the fashionista who posts his/her outfit of the day every day to entertain and keep up with his/her loved ones, to becoming a style inspiration for thousands? Or how can a pretty lady who enjoys doing her own makeup transition to an online tutor for thousands of viewers worldwide? And finally, how do you make money off doing what you love? It all lies in an idea, a unique idea. In this panel session, youâll learn easy steps to becoming an influencer and making money from it. If you want to go the entrepreneurial route, how do you balance it with your daytime job and ensure that no one suffers? Youâll learn about key steps you should take to avoid being overwhelmed with the activities you have to complete. Youâll also learn how to manage your finances and make wise investments to protect your business and brand. Get a glimpse into the booming influencer industry, and learn the inside scoop on how to adapt to the changes in todayâs dynamic internet sphere from these experts. Register for this panel onÂ www.smwlagos.com.